"'Cells' began as a kind of ‘clay journal’ connecting sources of inspiration." The Anthropocene is a proposed epoch that began when human activities started to have a significant global impact on Earth’s geology and ecosystems. Anthroplastique reflects our increasingly precarious relationship with the planet. The pieces follow themes and share iconography that flow from one panel or piece to the next. Lougee uses mediums including ceramics, collaged and sewn paper, and her signature material, crocheted post-consumer plastic bags, for a new look at our habits, ourselves, and our precious planet. In a large installation entitled “Ubiquitous”, Lougee envisions the abstract microscopic inhabitants of a drop of water. The vibrant, textural forms want to wiggle and stretch out, eager to colonize their surroundings. 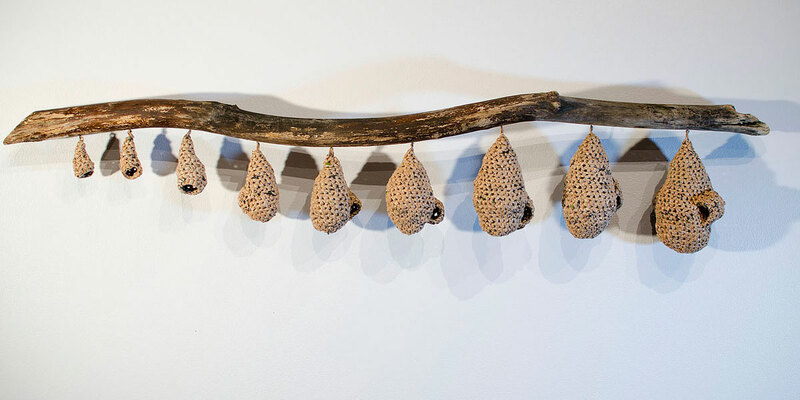 These works elicit a tension with nature. Produced from collected post-consumer plastic that would otherwise find its way to a landfill, they are easy to look at, cheerful even, but they represent deep problems in our culture and environment. Since the human body is 60% water, it quickly becomes personal. The drawings in the exhibit are formed from plastic bags stitched and layered with other castoff bits, including papyrus, cloth, paper, and sketches. The pieces reference the world around us. They can be interpreted as landscapes or cell structures, or sometimes both simultaneously. 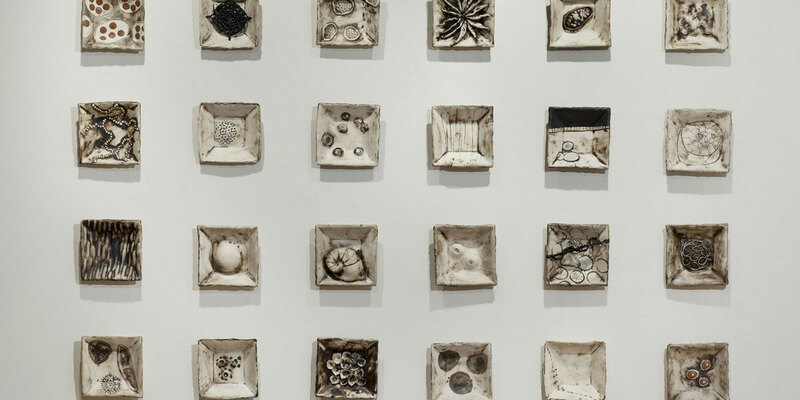 ‘Cells’ began as a kind of “clay journal” connecting sources of inspiration. After a visit to a cancer research lab and looking at HeLa cells under a microscope, Lougee began to work with cell imagery. 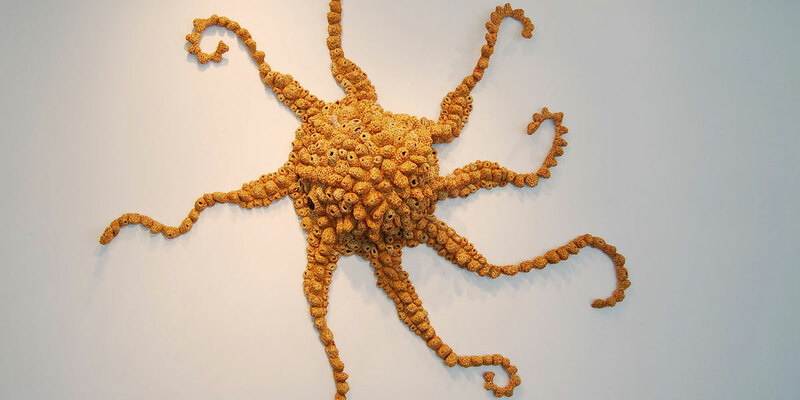 She created one piece a day, with each piece suggesting the next. 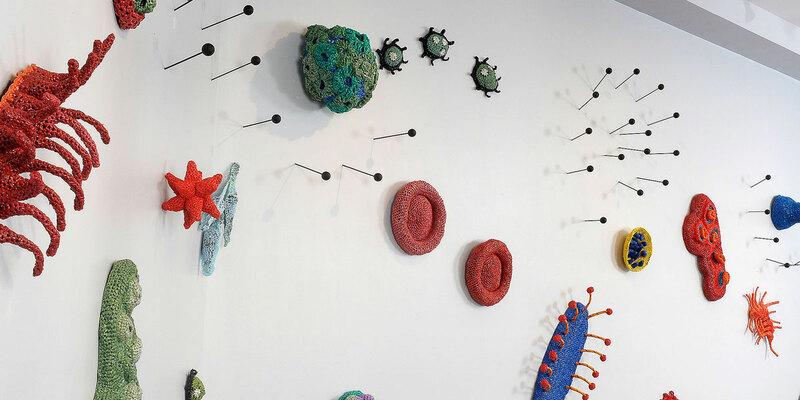 The inspirations for the “cells” include blood cells, phytoplankton, fossils, caterpillars, vegetation, recycling, and more.